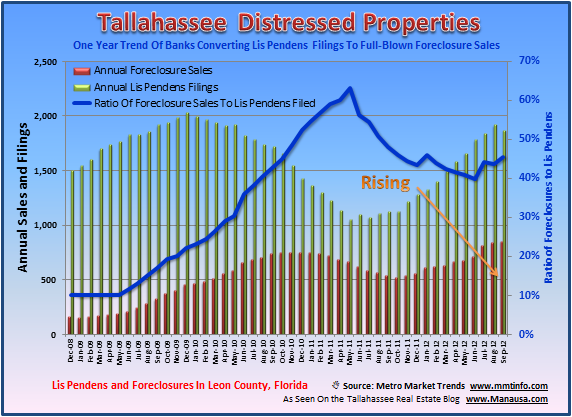 New lis pendens filings in Tallahassee fell 28% in September when compared to September 2011, but foreclosure sales jumped by 23%. This is the first sign of slowing for new filings in a year, which is great news, but there are still a lot of distressed properties moving towards the Tallahassee real estate market. Currently, the foreclosure sale to Lis Pendens filings ratio has dropped from an all time high 12 months ago to 46%, as we can see with the blue line in the foreclosure graph below. Hi Joe: Any idea when the October report on Foreclosures is published? Thanks! Nice job with this site. Hey Jerry, I usually get each month done between the 15th and the 20th. The data was consolidated early this month, so it won't be long.